Lately, the weather here in Kansas City has been absolutely gorgeous!! Now is a great time to get out and enjoy it! 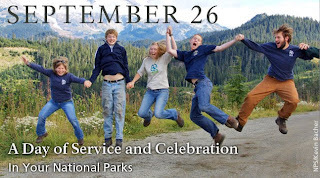 This weekend, you can go to any of the National Parks for free!! Click on your state on this site and find one near where you live. Head to a local museum for FREE. You can check out the link to print out your free passes right here. Stop by Lowes for a Free Build & Grow Workshop. This weekend the kids will make a Firetruck. This event begins Saturday morning at 10:00 a.m.
Head out to the Wyandotte Arts Festival. This starts at Noon on Sunday, September 27th, and runs until 5:00 p.m. It is at the Hollis Renewal Center 11414 Kansas Avenue, Kansas City, Kan. (just south of the speedway). You can find hands-on activities for all ages and family members. The event is FREE! Check out more great fun, cheap (or even free) family activities at KC Parent! « Get Ready for an Improved Site!